Internet Archaeol. 25. Williams. Kyz Bibi complex. Figure 53: Short narrated slide show about the Kyz Bibi complex. There are 26 images of this building, taken over the period from 1890 to the present day, in the photographic archive. In addition, a rotating image was created in 2006 (Fig. 52) and a short narrated slide show (Fig. 53). The Kyz Bibi mausoleum is located 150m west of the 11th-century city walls (Fig. 33). The mausoleum is square, with fired brick foundations, c. 7.5 x 7.5m, and a single chamber, 4.30 x 4.50m, roofed with a dome. The building has deteriorated much over the past century (see Figs. 54, 55, 56 and 57). Although it is now the only standing building in the area, it was probably originally part of a more extensive complex, which included a mosque and possible khanqah, to the south-east, and another structure, of unknown function, some 16m to the west (Herrmann et al. 1996, 19). There are also two mounds to the north-west, which are probably caravanserais. The other structures in the area have been poorly documented and conserved, especially during the early 1990s with the use of very detrimental concrete capping: the remains have suffered badly (Fig. 58). There is no clear dating evidence for the building complex from the excavations thus far conducted. The Kyz Bibi monument is rather smaller and simpler than Seljuk mausolea, with a slightly different plan, perhaps suggesting that it pre-dates that period and may be c. 9th/10th century in construction. Figure 54 (top left): Kyz Bibi (to the right) photographed in 1890 by Zhukovsky. Note the intact dome. Figure 55 (top right): Kyz Bibi photographed in 1926 by Rtveladze. The upper part of the dome had collapsed or been dismantled and part of the external fired brick facing had collapsed/been removed. Figure 56 (bottom left): Kyz Bibi in 1974, photographed by Atagaryev and Pilyavsky in a very ruinous state. Figure 57 (bottom right): Kyz Bibi in 1992, during restoration. 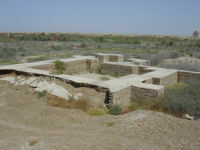 Figure 58: The mosque to the east of Kyz Bibi, excavated and 'conserved' with inappropriate concrete capping in 1992; now in a very poor condition.